What Is the Best Brewery in America? It is over, friends. After over 1,500,000 votes cast, thousands of comments written, and at least one Vote or Die T-shirt purchased, we have a winner in our Craft Brewery Championship. 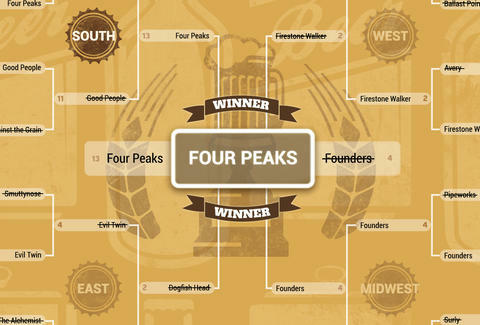 Four Peaks, a 13 seed out of Arizona, shocked the world by defeating perennial Grand Rapids favorite Founders with 51% of the vote in the National Championship. They also defeated Funky Buddha, Hardywood, Cigar City, and even freakin’ Dogfish Head on their way to the title. How did they do it? Was it ballot stuffing? Bribes over Venmo? A grassroots voting campaign run by Howard Dean’s nephews? We don’t actually know, but we do know that they will soon be drinking from our sweet 2015 Craft Beer Championship stein trophy, as soon as we order it from one of those shops that makes them. Thanks for playing and check back with us next year to see if they can defend their crown. And if you still want to yell about how your favorite brewery didn't make it into the 2015 Championship, click here to see the larger bracket.